Johnson's Western Hemisphere. Johnson's Eastern Hemisphere. 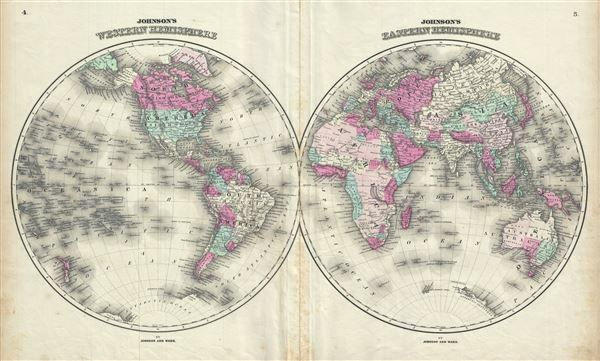 This is an 1863 A. J. Johnson and Benjamin P. Ward map of the world on a hemispherical projection. Offering a look at the world during a period of rapid globalization, the map depicts the world in two hemispheres, with the hemispheres meeting in the Atlantic Ocean. Africa is largely 'unexplored', though Lake Uniamesi, something that may be taken for an embryonic form of Lake Victoria, Lake Tanganyika or both, does appear. This curious lake, supposedly identified by Speak, was frequently written of in mid-century missionary reports as the source of several important African river systems, including the Congo. The Antarctic continent is partially illustrated, representing the relatively primitive state of Antarctic exploration in 1863. As this map predates the purchase of Alaska from Russia, Alaska is simply labeled as 'Russian Possessions'. Countries throughout the world are labeled, along with myriad cities and towns. Published by A. J. Johnson and Benjamin P. Ward as plate nos. 4-5 in the scarce 1863 edition of Johnson's Family Atlas. This is the second edition of Johnson's atlas to bear the 'Johnson and Ward' imprint. Very good. Minor wear and toning along original centerfold. Some spotting along edges. Blank on verso.